Besides these players Genoa also bought some youngsters like: Ciro Immobile (Juventus), Stefan Simic (Slavia Prague) and Andy Polo (Club Universitario de Deportes). Again a match with a lot of goals, with this time 3 points to the boys of Pasquale Marino: 3-2. The last weeks Genoa is the most attractive team in Italy, or maybe Europe with results like 3-2, 3-5 and again 3-2. 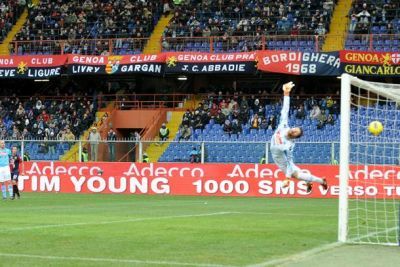 This time Genoa played fantastic in the first 30 minutes and with goals of Palacio (fantastic shot from the corner of the penalty-area in the far 7 of the goal) and Gilardino (his first with Genoa) the score at halftime was 2-0. When halfway the second half again Rodrigo Palacio scored the third goal everybody expected the match was over, except Napoli-players Cavani and Lavezzi who scored 3-1 and 3-2 within 1 minute. The last 15 minutes the Genoa-fans had to suffer as never before, but Sebastien Frey kept his goal clean and with 27 points in 20 matches Genoa is now on the shared 8th position. 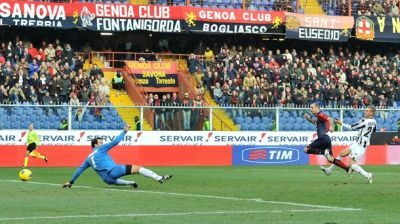 Wednesday at 18.00 hours Genoa plays in Bergamo. Genoa lost 5-3 in Palermo and is now 10th in the standings. Despite the 7 injuries (Dainelli, Kaladze, Antonelli, Bovo, Rossi, Veloso and Constant) and the debut of Mario Sampirisi Genoa started the match very good in Palermo: after a fantastic combination of Mesto and Gilardino it was Rodrigo Palacio who scored the first goal after 13 minutes. Immediately after the goal the “Tsunami” of Palermo started and the halftime arrived with a 3-1 score to Palermo. Also in the second half Genoa started good and Palacio scored a penalty (3-2) after a handball of defender Balzaretti and brought us back in the match. But just as in the first half it was Palermo that was the most dangerous teams and they scored 4-2 and 5-2. At the end Genoa had several chances and with a little bit more luck we could score more goals than just the one of Jankovic in the 89th minute: 5-3. Next Sunday our friends of Napoli arrive in Marassi, let’s hope that playmaker Miguel Veloso and some of our defenders are healthy again. Exactly 365 days after his transfer towards Lazio our wingstriker Giuseppe Sculli returned to Genoa. Mr. Marino wants to play with 3 strikers, so we needed besides Palacio and Jankovic at least one other player to help Alberto Gilardino in the attack of Genoa. 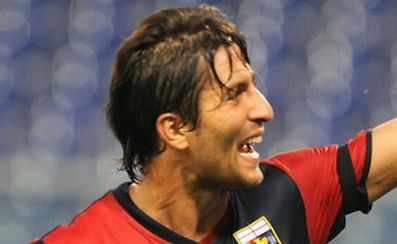 Sculli already played 4,5 years with Genoa from 2006 till the winter of last season. We still remember him as the “supporter” who ran into the field during the last minutes of Genoa-Napoli at the day both teams promoted to Serie A and the player who scored the great goal in the last minute against Lille in the Europa League. Welcome back Beppe! Tonight the substitutes of Genoa lost 2-1 in the 1/8 finals of the Coppa Italia in Giuseppe Meazza against Inter. The black and blue of Ranieri first scored twice by Maicon and Poli before Valter Birsa scored his first official Genoa-goal in the 91st minute. Only 2 minutes of injury-time were left, which was too short to score the equalizer. Now we can fully concentrate on Serie A and try to reach the first 7 places to return in the Europa League. The next match is Sunday at 15.00 hours in Palermo. What a fantastic match! Against nr. 3 in the standings Udinese Genoa played its best match so far this season. After the defeats against Napoli and Cagliari the team of Mr. Marino was 110% motivated to play a good match unless the missing of 5 defenders: Dainelli, Kaladze, Bovo, Moretti and Antonelli. The defense was now formed by the real defenders Mesto and Granqvist and the midfieldplayers Rossi and Constant. Genoa started good in the match and got some chances with Gilardino and Merkel, but Udinese opened the score in the 14th minute by a header of Ferronetti: 0-1. Unless a very attractive first half we had to wait for more goals after the break. After only 4 minutes in the second half Granqvist scored the equalizer being the fastest player in the rebound of the extremely hard free-kick of Jankovic that was blocked by keeper Handanovic: 1-1. Only 1 minute later Bosko Jankovic himself scored the second goal after a perfect cross of Constant: 2-1. Genoa created more and more changes, but on the other side Udinese was a few times very dangerous but this season we have goalkeeper Sebastien Frey. In the 71st minute Palacio scored 3-1 after a cross of Gilardino. Everybody who now thought the match was over was totally wrong, because within 2 minutes referee Doveri brought the black and white of Friuli back in the match. Marco Rossi touched the ball in front of topscorer Antonio di Natala, but the referee gave Udinese a penalty and our captain a red card. Di Natale scored the penalty and Genoa had to play the last 20 minutes with 10 against eleven. Of course Udinese was the best team this last minutes, but Sebastien Frey saved us a few times and after the last whistle the stadium went completely crazy, what a match! Genoa is now 8th in the standings, but more important: back in the field with attractive, offensive and powerfull football. Davide Biondini the medicine for our midfield? The biggest problems of Genoa of the last weeks are in the midfield and the forwards. In the summer of 2011 our President Preziosi said that Genoa probably had the best midfield in Serie A with Kucka, Veloso, Merkel, Birsa and Constant. Especially Kucka and Costant don’t play like we all expected. The whole summer Genoa tried to buy central-forward Alberto Gilardino but Fiorentina refused the fantastic offer of €12 million, so at the end Genoa bought Andrea Caracciolo, after we first bought Pratto, Ribas and Zé Eduardo. Except Rodrigo Palacio none of the strikers scored the number of goals we all hoped, so Mr. Preziosi returned to Fiorentina 2 weeks ago and now bought Gilardino with a reduction of €4 million comparing to last summer. In midfield we now hope to find the solution with Davide Biondini the red haired “Gattuso” of Cagliari. The nearly 29 years old midfieldplayer has an experience of 7 years in Serie A and probably will be already in the line-up against Udinese (nr. 3 of the standings). Our new trainer Pasquale Marino likes the “Dutch way” of playing football: 4-3-3. 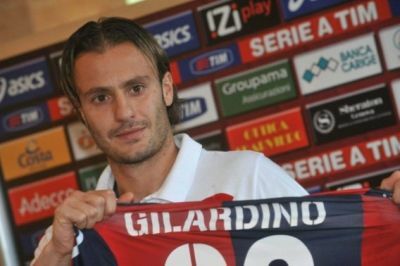 In this system with 3 strikers you need good players at the wings, but with Palacio we only have 1 good wingplayer to assist central forward Alberto Gilardino. To play at the left wing we need a new player which probably will be Giuseppe Sculli. 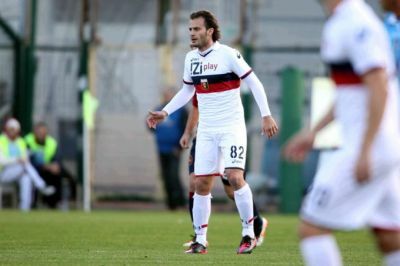 “Beppe” already played 4,5 years with Genoa before he was transferred to Lazio in the summer of 2010. After the arrival of Gilardino and Biondini we wait for more transfernews the next days, but first we play against Udinese tomorrow at 15.00 hours. A very important match because of the terrible defeats against Napoli and Cagliari. The only problem: we only have 2 defenders (Mesto and Granqvist) healthy for the match.